Here is a round-up of some of the cases at Blackpool Magistrates Court from October 24. A former soldier flew into a rage after his former girlfriend refused to give him a lift back to hospital. 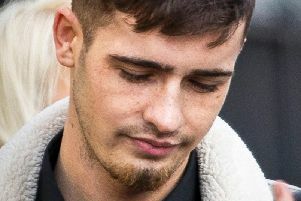 Stephen Coran, who had been in a spinal unit with leg problems following a rugby injury, threw a house brick at his ex partner’s home and father’s car. Coran, 46, who is said to be temporarily staying at an address in Stratford Place, Blackpool, pleaded guilty to two offences of damage. Pam Smith, prosecuting, said Coran had been picked up from the Royal Preston Hospital by his ex. He later went drinking and she refused to give him a lift back to the hospital. On October 22 she saw Coran throw a brick several times at her father’s car smashing the windscreen and causing dents and scratches to the bodywork, the court heard. An hour later he returned and threw a brick through her front window. In a victim’s impact statement read to the court, Coran’s ex said she was scared and suffering from anxiety. She would normally go to church on Sundays but she did not feel safe to go out. Peter Manning, defending, said his client, who had been in the Army for 15 years serving in the Gulf war, Afghanistan and Bosnia, realised his behaviour was unacceptable and that the relationship was over. Coran had been in hospital for four weeks because he was having difficulties with his legs, possibly related to a rugby injury he suffered some time ago. the court was told that when his ex refused to give him a lift back to hospital, he lost his bed at the unit there. His ex would not take him in, so he was on the streets and lost his temper. Coran was sentenced to a six-month community order with up to 15 days’ rehabilitation to be supervised by the Probation Service, fined £20 with £50 costs, ordered to pay £275 compensation plus £85 costs and put on a 12 months restraining order not to contact his ex or go to her home or workplace roads by Blackpool magistrates. A man trying to make a living by collecting scrap fell foul of the law when he was seen near a fire-damaged building in Blackpool. Daniel Geoghegan became so threatening and uncooperative police had to pepper-spray him to get him under control. Geoghegan, 26, of Winsford Crescent, Cleveleys, pleaded guilty to going equipped for theft with a hammer and screwdriver. Pam Smith, prosecuting, said police received information a man was moving metal fencing in front of a fire-damaged building on Empress Drive on October 21 at 10.50pm. The court was told an officer arrived to find a washing machine and components strewn about. A hammer and screwdriver were found in his bag. Kathryn Jameson-Sinclair, defending, said her client’s mental health had been deteriorating and he had an appointment with a psychiatrist soon. Geoghegan had found it hard to get a job so he had decided to become self-employed and collect scrap metal. People gave him items they were throwing out and he had used the screwdriver and hammer to strip wire he could sell from items such as televisions. He had failed to understand that once people had left items out for the bins they became the property of the council. Geoghegan was given an 18-month conditional discharge and ordered to pay £85 costs with £20 victims’ surcharge by magistrates. A teenage girl was described by police as ‘having a tantrum’ after she was told to stop screaming and disturbing flat tenants in the early hours. Jade Shaw threw herself on the floor kicking out and flailing her arms at an officer after she was told she would have to leave the block of flats, a court was told. Shaw, 18, formerly of St Andrews Road South, St Annes, now of no fixed address, pleaded guilty to breach of the peace and was bound over in the sum of £100 for 12 months by Blackpool magistrates. Pam Smith, prosecuting, said police were called to the report of a disturbance at flats in Blackpool’s Osborne Road on October 23 at 4.20am. Shaw was screaming at the top of her voice and other tenants were asking police to remove her. Shaw did not live at the flats and refused to give police her mother’s address before throwing herself on the floor in a tantrum. A man accused of putting a bag of spinach under a neighbouring couple’s door during an affray has made his first appearance at court. Conrad Swindells and his partner Amy Monteith are also alleged to have assaulted their neighbours in a block of flats at Blackpool. Swindells, 34, and Monteith, 27, both of Warbreck Drive, North Shore, each pleaded not guilty to assaulting a man and a woman and damaging a flat door on October 22. The prosecution opposed bail for Swindells, who also denied an offence of affray. The couple were bailed for trial on January 6 by magistrates. They must report daily to police and not contact the complainants or enter Warbreck Drive as conditions of their bail. A man has been banned from all restaurants unless he pays for his food beforehand. Simon Griffiths, 27, of The Promenade, Blackpool, pleaded not guilty to fraud by failing to pay for £100 of Cantonese food and alcohol at the Mandarin restaurant, Clifton Street, Blackpool. The prosecution opposed an application for bail for Griffiths by defence lawyer Mitch Sarangi. Griffiths was bailed for trial by magistrates. In addition to pre-paying for his food at restaurants, he must report to police three times a week as conditions of his bail.